If you are a TV show buff or just want to learn more about your favorite TV actors this Trivia is for you! 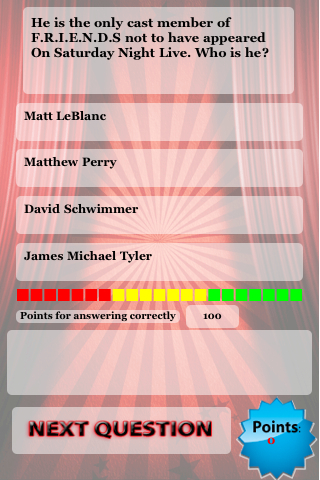 With 100 questions we more then double the questions that other apps offer! Not to mention our numerous features that most don't consider! 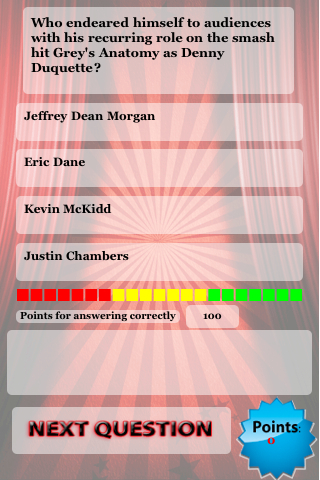 Test your skills against the world in TV Stars Trivia! 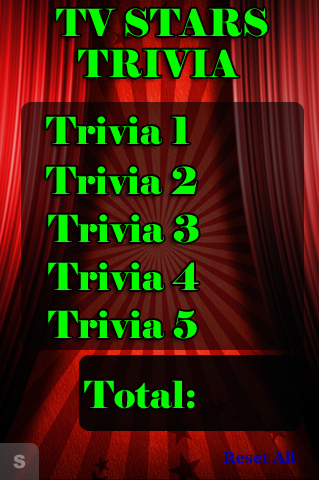 TV Stars Trivia is filled with 5 banks of trivia containing 100 questions! - 100 Questions all about TV Stars! Also checkout our other Apps: Movie Stars Trivia, Twilight The Movie Trivia, Twilight the Novel Trivia, iFartster, iBurping, Wine Trivia, Dumb Law Trivia, Beer Trivia, iSounds Guns, iSounds Warfare, iSounds 200, iSounds Animals, iSounds Human Sayings, iSounds Babies, iVacation Hawaii, iVacation Philadelphia, iVacation Denver, iVacation New York and MORE! If you enjoy other apps like Trivia Master, Mr. Trivia, Wheel of Fortune, Quizner's, Who Wants To Be A Millionaire, The Price Is Right, Deal or No Deal, Hollywood Trivia, Smarter Than A 5TH Grader, Brain Challenge, IQ-Test, 1 vs 100, New Moon Book or Trivia, Twilight Trivia, Brain Tuner, Pop Quiz, PopQ Quick, or any of the popular trivia games we recommend you try our Trivia apps as they are fun, feature filled, and you can compare your score against other players around the world in our Global Leaderboard! More Games by EmJa Interactive, LLC.